The nameplate shows that the organ was made by Samuel Green in 1787. The numbering on keyboard and chest shows that it was made simultaneously with an almost identical organ in a Herefordshire country house. To set the organ in the context of Green’s work, read ‘The Instruments of Samuel Green’ by David Wickens (Macmillan 1987). 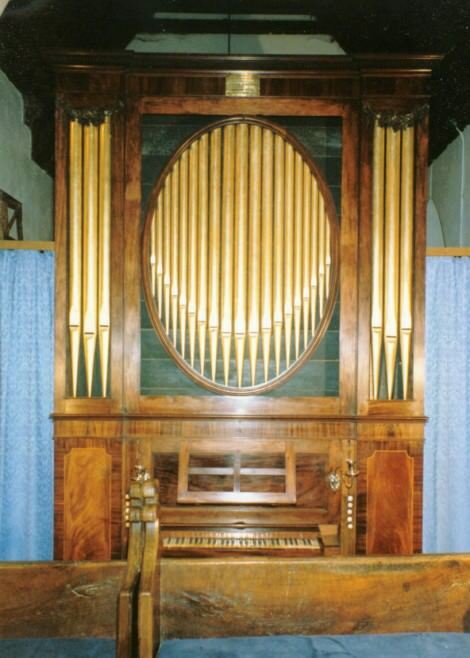 The organ is supposed to have been made for a London house, and sold in 1842 to the Rev C.H.Lucas, who had it brought up by rail and installed in Edith Weston Hall. It was given by Richard Lucas to the church in 1867. Shortly afterwards the organ was restored and made a bit more suitable for use in church, presumably by Porritt of Leicester, for a torn scrap of paper stuck to it is a “Memorandum Sep 13 1873 from J Porritt Midland Counties Organ Manufactory”. The bellows is now horizontal with a compensating fold. The original swell front was replaced. The wind pressure was raised from 55mm (the pressure of the Herefordshire twin) to 65mm, and most of the mouths were raised a bit. The decorative brass chicken wire and dark green silk backing in the spandrels of the central oval were replaced with black cloth. Sometime after 1945 the pallets were re-leathered, with thick green felt on the pallets, and Green’s characteristic pulldown wires were replaced. Tuning slides were added (with equal temperament tuning), the tierce rank was removed from the Cornet, and an electric blower was provided (fed into the reservoir with a flexible hose through the top leaf). GG/AA – f³ (58 notes). The pitch in 1981 was found to be A424Hz at 15ºC, which suggests that the tuning pipe (c¹ of the Principal) has been not cut down. We restored the pipe lengths to their original, and after a great deal of measuring and calculation to restore the tuning system, a slightly irregular ¼ comma meantone. We also put a new tierce rank back. In all essentials this feels and looks like a typical Samuel Green chamber organ.